Do you have a team of sales reps out in the field making regular customer visits? Connect Skynamo Sales App to Sage to get Finance and Sales working together to increase your cashflow. Enable sales reps to submit accurate orders, quotes, credit requests and job cards while at a customer...even offline! 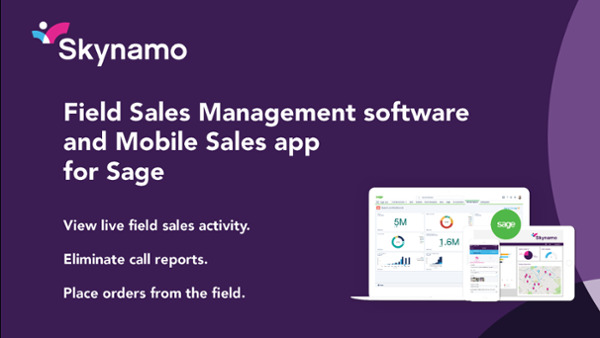 Skynamo (formerly known as Honeybee) is a mobile-first sales app and Field Sales Management software for Sage that seamlessly connects sales to finance, so your sales and finance teams view the same data all the time – even while sales reps are on the road. Plus, offline functionality means sales reps can continue working even if offline and data gets synchronised as soon as they come back online. Skynamo is been built for businesses with a mobile or field sales force that make face-to-face customer visits on a regular basis to conduct stock takes, order stock, conduct retail audits or market research and manage their customer relationships. Skynamo is used by over 420 manufacturers, distributors and wholesalers of Food & Beverages, Wine & Spirits, Building Material & Hardware, Automotive, Chemicals, Oil & Lubricants, Homeware & Electronics, Medical supplies and more. Contact us for a fantastic demo and engaging discussion on how Sage and Skynamo can - together - increase your cashflow.